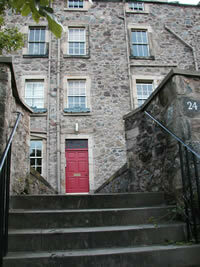 24 Calton Hill (first floor) is in a rare pre-Georgian building, first occupied in 1772 (see the original title 'deed of sasine'). Many of the original features remain intact including the baltic pine floor boards, the wood panelled kitchen ceiling, the rarely-square door frames. Yet modern convenience has been tastefully introduced. 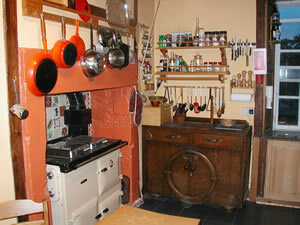 The kitchen is a true "cook's kitchen" featuring a cast-iron Rayburn cooker, hand-wrought hardwood counters and kitchen table, and a collection of good quality utensils. Modern appliances, such as the microwave oven, large refrigerator/freezer, dishwasher, and even a coffee-bean grinder, have been tastefully concealed giving the kitchen a real 'farmhouse' kitchen feel in the middle of the city. The front hall of the flat features a computer with broadband internet connection, and for those of you travelling with a laptop, you will be delighted to have an 802.11b wireless network, which even reaches out to the front garden! There is also a washer/dryer in the closet off the front hallway; however use the drying rack in front of the Rayburn in the kitchen for a very fast wrinkle-free drying. 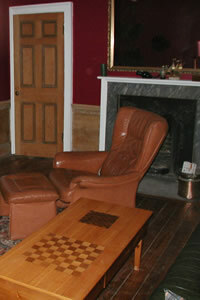 The sitting room has been decorated on a 'Georgian club' feel, with rich burgundy walls and luxurious teak and green leather sofa and armchairs. 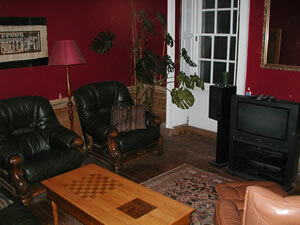 It features a modern entertainment centre including digital television, DVD and sound system. 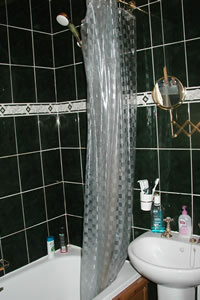 The bathroom is tastefully decorated in green tile, with WC, bathtub (with shower), basin and medicine cabinet. Bedroom three ("office"): So-called as it was formerly the owners' office. 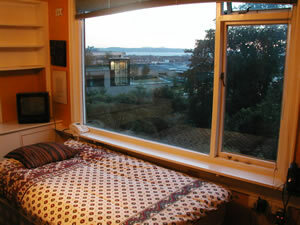 Small, but with stunning views through a panoramic picture window. Small double sofabed & wardrobe. There is also a small windowless box room with a single bed - it is virtually soundproof and while not to everyone's taste, many people have reported an incredibly sound sleep here! Finally, the back hallway has been made into a small library with an extensive collection of books, from history, travel, fiction/science fiction, and more. You are welcome to browse these during your stay. The library also features a 'secret door' leading to the office -- see if you can find it when you first arrive!